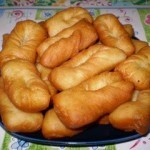 Boortsog is a Mongolian food recipe of fried sweet dough. Dissolve salt, sugar, and butter in warm water. Mix in flour and knead well and thoroughly into a smooth, soft, and elastic dough. Knead the dough until no air or bubbles remain. 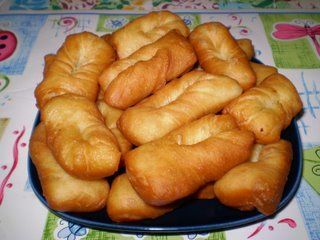 Let the dough rest, covered with a moist cloth, after kneading for about 15– 20 minutes. Roll out on a floured surface to 1⁄4-inch thick. Cut out into 2-inch squares or small triangles with a sharp knife. In the middle of each piece, make two shallow cuts. Heat oil over medium heat. Fry boortsog in small batches until golden brown. Drain on paper towels or a rack until cool.